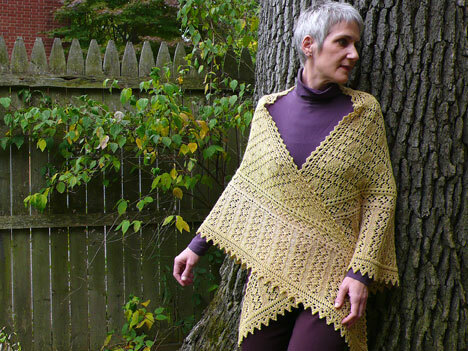 when i named this shawl, i was thinking only that the triangular shape and gingerbread-type patterns reminded me of that spot in the eves where the roof peaks—the spot where birds like to hang out. once i actually looked up the term on the internet, i found so much more interesting information about dovecote structures and history (and we haven’t told david yet, but now i want one of my own). you must take a look after you finish here; it’s fascinating (who knew there was such a thing as pigeon racing??). there are some dovecotes that look similar to my original vision of them, but generally, they are much more elaborate and tailored to the pursuit of raising birds. my very favorite photo is this interior shot—i was completely pleased to discover this pattern of pigeonholes, or boulins, entirely in keeping with the fabric of my shawl. 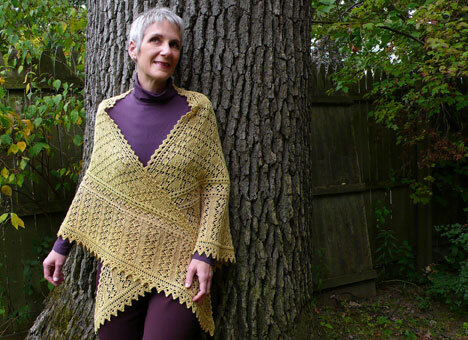 shown above: size tall in canopy bamboo/alpaca/merino blend from the fibre company, colorway cat’s claw; click here for a complete list of retailers. flower pin shown with shawl on this page was purchased from perl grey. kate and courtney at kelbourne woolens enthusiastically sponsored this project (and the upcoming partner stole, birnum wood, to be released later this week) by providing the luxuriously beautiful fibre company yarn shown here. thank you so much for your generous support! karolyn and jocelyn eagerly dove into the test knit for this piece and whipped through them so fast it made my head spin. 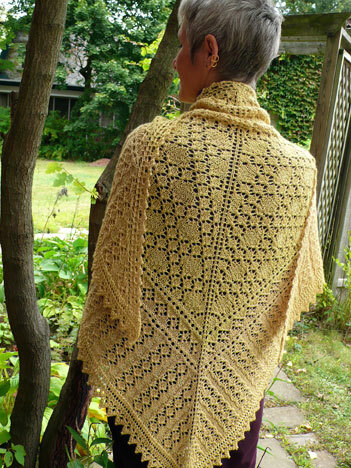 jocelyn used some lovely shetland in a natural color. karolyn, BTW, highly recommends this yarn and this pattern—just ask her (she’s knit three of them and i swear she’s all set to do another if needed). david raced the dark and the impending rain on friday evening to bring you these lovely photos and did an excellent job at that. It’s gorgeous, and as for pigeon racing, here in the UK it’s well known, in fact the Queen has, or used to have, pigeons, not kept personally by HRH you understand, probably a serf in Sandringham. Many an unhappy hour in my youth was spent working out average speed and times after a race, and trying to persuade the little blighters to come into the loft to have their leg ring put through the time clock….now back to the swallowtail and a large coffee…. During WWI my father was a child and caught pidgeons and doves, raised them, and sold the birds and eggs to neighbors during that difficult time. I wonder if that’s one reason why I am so fond on the doves that feed in our yard daily? Oh I love it! I like the slight geometry of the patterns and how they form a soft lace instead of a harder overall shape. 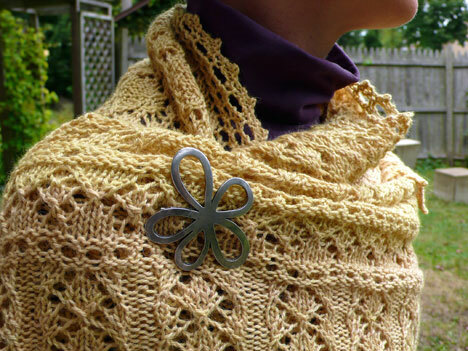 I’m just finishing up a shawl right now, this one might be the next one for me! I’m off to look at the yarn options. It’s lovely! I really enjoyed refreshing my memory on dovecotes, and am determined to have on, too. Should be required again, no? 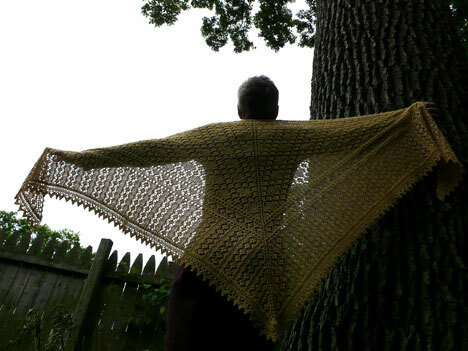 That solves it….this is my next shawl once Moth is finished. 🙂 Beeutiful!! However does Karolyn knit so fast?? Just beautiful, as I knew it would be! And the photos, too, they really show how much you love it. I just want to knit all of them! Tell me, how do you get to be a faster knitter??? 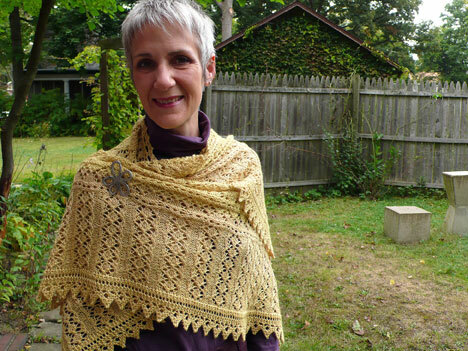 Oh, Anne, that shawl is perfection! It’s truly beautiful, (and looks wonderful on you, too!) Your ongoing descriptions of the yarn make me want to drop everything and cast on this minute! It’s going in the queue soon, for sure. 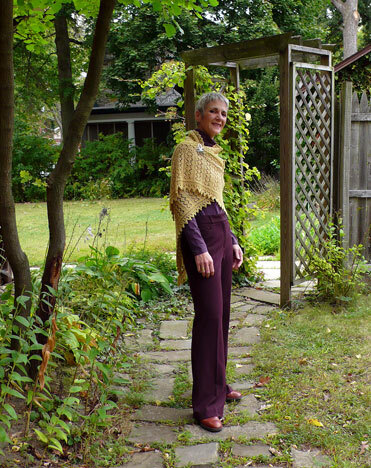 So… you grow this great big fecund garden, and process the tons of lovely things coming out of it, and design incredible stuff (new shawl!wow! ), and knit, and write a blog, and cook great things. I want to know, do you have more hours in your day than I do?! PS – I agree with Kay from New Mexico – I think you are a creative genius and WONDER WOMAN combined in one. 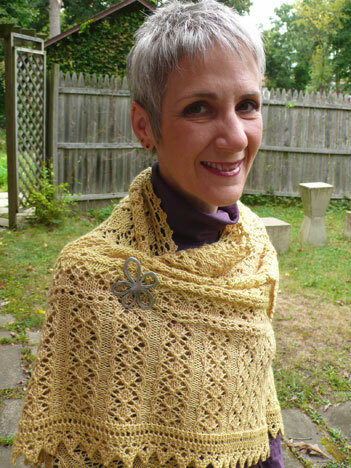 Another favorite shawl. I’m so far behind in knitting all the shawls of yours that I want to! This one is really calling to me! 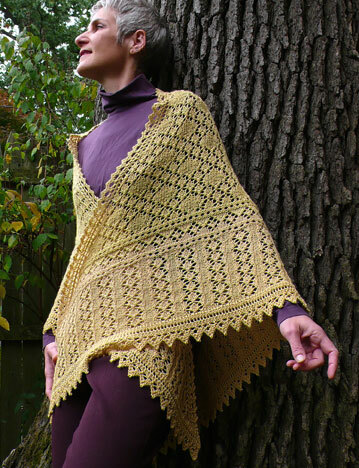 I can certainly see why this glorious shawl kept your attention, and would call you from across the room. so sweet, and like the doves curling up in the rafters, I’d want to curl up under this one. Oh, and how difficult is this pattern? 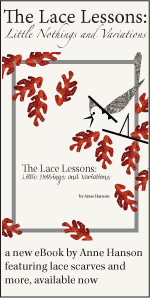 Is it lace knitting on all rows? I have to have lots of uninterrupted time to do that kind of knitting on a big project! 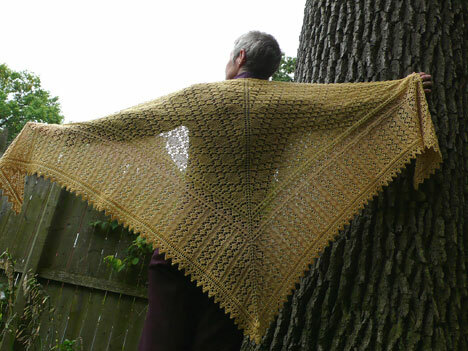 The shawl is spectacular! And your new makeup looks fabulous. Oh it’s even prettier than I thought! As always. Gah I want one like NOW. OMG…this is spectacular. I have one other in queue after the one I’m currently working on…but this will be next! Thanks so much! 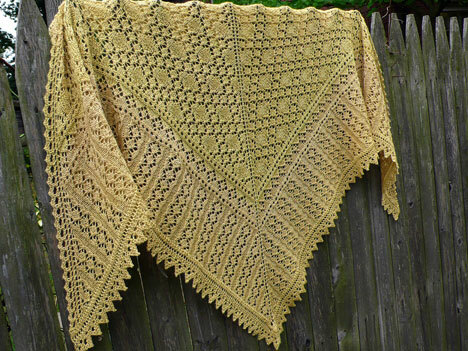 One word came to mind when I saw this shawl; MAGNIFICANT !!! Now that is just lovely–WOW. And I am SO looking forward to the wrap version later this week! I didn’t read the comments from the previous post, but for slugs I would suggest diatomaceous earth. It’s made from ground up insect shells and it sharp and unappealing to slugs and other pesties-but I don’t believe that it hurts earthworms. I know I keep saying this, but this shawl really is my favorite. I like the weight and the substance of it, as well as the beautiful pattern. 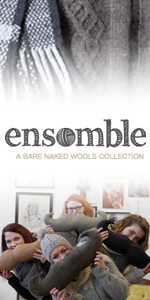 And of coure the yarn–nough said. Awesome! Love it! It shouts out for cosy wool & Autumn (Fall!) walks. I’ve fallen off the shawl bandwagon temporarily and am working on some socks and have a ton of WIPs in my head SCREAMING at me, but wow — this new shawl has me in tears, seriously, it is so gorgeous. I have some honey colored Blue moon fiber lace yarn … yep. Will start very soon. 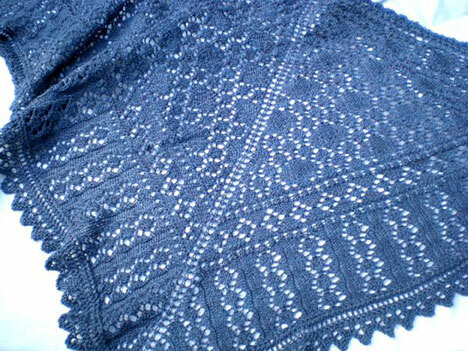 another very pretty shawl! i really like the way the geometry works out in this one. I just love this blog. You are a wealth of information and inspiration. Please tell David your readers appreciate his haste. The pictures turned out lovely. Another beauty! Wowie Zowie. You are awesome! How do you consistently do it? 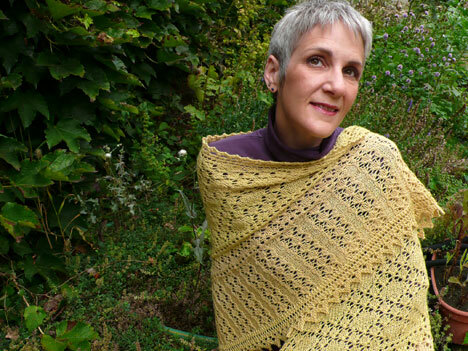 Another stunning shawl! This one is so classy-and the pictures are perfect for this piece. I wish I had more time-you’re an inspiration. My knitting mojo was fading…bought some new yarn and now seeing this-gets the fingers itching! Thanks! Wow! Perfect on a chilly evening to knit while reading Hans Christian Anderson during breaks with tea! Like a fairytale! All of your designs are just beautiful. This one is no exception. Lovely! Incredible buildings! I can see why you were drawn to them, and I love what you’ve done with the pattern. Fabulous Anne. You are the Queen of lace, its so gorgeous. Unfortunately, our lofts look just like garden sheds with balconys, not the beautiful European structures, or beautiful lace shawls. Did you see the Glasgow doocots? The designs have deteroriated over the years. However, you have brought back the original lovely works of art through your use of shapes, structures and textures. Ooh! It’s gorgeous! I love that big size 🙂 But I’m loving my small size, too — I just can’t wait ’til it’s cool enough to wear it! Wow Anne. You outdid yourself. The Dovecote is gorgeous. I had to chuckle though, cuz I found out we have BATS living in our dovecote (not any more – they were persuaded to find a new dovecote). The blue one by Karolyn is gorgeous too.